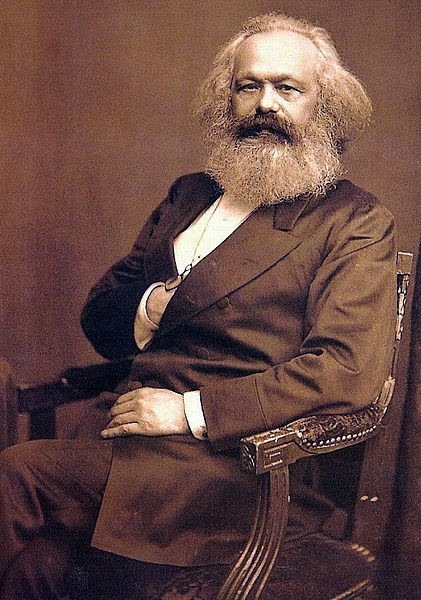 Karl Marx was a German philosopher, economist, sociologist, journalist, and revolutionary socialist. Marx's work in economics laid the basis for much of the current understanding of labour and its relation to capital, and subsequent economic thought. He published numerous books during his lifetime, the most notable being The Communist Manifesto (1848) and Das Kapital (1867–1894). Born into a wealthy middle-class family in Trier in the Prussian Rhineland, Marx studied at the Universities of Bonn and Berlin where he became interested in the philosophical ideas of the Young Hegelians. After his studies he wrote for Rheinische Zeitung, a radical newspaper in Cologne, and began to work out the theory of the materialist conception of history. He moved to Paris in 1843, where he began writing for other radical newspapers and met Friedrich Engels, who would become his lifelong friend and collaborator. In 1849 he was exiled and moved to London together with his wife and children, where he continued writing and formulating his theories about social and economic activity. He also campaigned for socialism and became a significant figure in the International Workingmen's Association. Marx's theories about society, economics and politics—the collective understanding of which is known as Marxism—hold that human societies progress through class struggle: a conflict between an ownership class that controls production and a dispossessed labouring class that provides the labour for production. States, Marx believed, were run on behalf of the ruling class and in their interest while representing it as the common interest of all; and he predicted that, like previous socioeconomic systems, capitalism produced internal tensions which would lead to its self-destruction and replacement by a new system: socialism. He argued that class antagonisms under capitalism between the bourgeoisie and proletariat would eventuate in the working class' conquest of political power and eventually establish a classless society, communism, a society governed by a free association of producers. Marx actively fought for its implementation, arguing that the working class should carry out organised revolutionary action to topple capitalism and bring about socio-economic change. Both lauded and criticized, Marx has been described as one of the most influential figures in human history. Many intellectuals, labour unions and political parties worldwide have been influenced by Marx's ideas, with many variations on his groundwork. Marx is typically cited, with Émile Durkheim and Max Weber, as one of the three principal architects of modern social science. Karl Marx was born on 5 May 1818 to Heinrich Marx and Henrietta Pressburg (1788-1863). He was born at 664 Brückergasse in Trier, a town then part of the Kingdom of Prussia's Province of the Lower Rhine. Ancestrally Jewish, his maternal grandfather was a Dutch rabbi, while his paternal line had supplied Trier's rabbis since 1723, a role taken by his grandfather Meier Halevi Marx. Karl's father, as a child known as Herschel, was the first in the line to receive a secular education; he became a lawyer and lived a relatively wealthy and middle-class existence, with his family owning a number of Moselle vineyards. Prior to his son's birth, and to escape the constraints of anti-semitic legislation, Herschel converted from Judaism to Lutheranism, the main Protestant denomination in Germany and Prussia at the time, taking on the German forename of Heinrich over the Yiddish Herschel. Marx's birthplace in Trier. It was purchased by the Social Democratic Party of Germany in 1928 and now houses a museum devoted to him. Largely non-religious, Heinrich was a man of the Enlightenment, interested in the ideas of the philosophers Immanuel Kant and Voltaire. A classical liberal, he took part in agitation for a constitution and reforms in Prussia, then governed by an absolute monarchy. In 1815 Heinrich Marx began work as an attorney, in 1819 moving his family to a ten-room property near the Porta Nigra. His wife, a Dutch Jewish woman, Henrietta Pressburg, was semi-literate and was said to suffer from "excessive mother love", devoting much time to her family and insisting on cleanliness within her home. She was from a prosperous business family that later founded the company Philips Electronics: she was great-aunt to Anton and Gerard Philips, and great-great-aunt to Frits Philips. Her sister Sophie Presburg 1797-1854,was Marx's aunt and was married to Lion Philips 1794-1866 Marx's uncle through this marriage,and was the grandfather of both Gerald and Anton Philips. Lion Philips was a wealthy Dutch Tobacco manufacturer and industrialist, upon whom Karl and Jenny Marx would later often come to rely for loans while they were exiled in London. In contrast to her husband, Henrietta retained her Jewish faith. Little is known of Karl Marx's childhood. The third of nine children, he became the oldest son when his brother Moritz died in 1819. Young Karl was baptised into the Lutheran Church in August 1824. His surviving siblings, Sophie, Hermann, Henriette, Louise, Emilie and Karoline, were also baptised as Lutherans. Young Karl was privately educated, by Heinrich Marx, until 1830, when he entered Trier High School, whose headmaster, Hugo Wyttenbach, was a friend of his father. By employing many liberal humanists as teachers, Wyttenbach incurred the anger of the local conservative government. Subsequently, police raided the school in 1832, and discovered that literature espousing political liberalism was being distributed among the students. Considering the distribution of such material a seditious act, the authorities instituted reforms and replaced several staff during Marx's attendance. In October 1835 at the age of 17, Marx travelled to the University of Bonn wishing to study philosophy and literature: however, his father insisted on law as a more practical field. Due to a condition referred to as a "weak chest", Karl was excused from military duty when he turned 18. While at the University at Bonn, Marx joined the Poets' Club, a group containing political radicals that was being monitored by the police. Marx also joined the Trier Tavern Club drinking society (Landsmannschaft der Treveraner), at one point serving as club co-president. Additionally, Marx was involved in certain disputes, some of which became serious: in August 1836 he took part in a duel with a member of the university's Borussian Korps. Although his grades in the first term were good, they soon deteriorated, leading his father to force a transfer to the more serious and academic University of Berlin. Spending summer and autumn 1836 in Trier, Marx became more serious about his studies and his life. He became engaged to Jenny von Westphalen, an educated baroness of the Prussian ruling class who had known Marx since childhood. Having broken off her engagement with a young aristocrat to be with Marx, their relationship was socially controversial due to the differences between their ethnic and class origins, but Marx befriended her father, a liberal aristocrat, Ludwig von Westphalen, and later dedicated his doctoral thesis to him. Seven years after their engagement, on 19 June 1843, Marx married Jenny in a Protestant church in Kreuznach. In October 1836 Marx arrived in Berlin, matriculating in the university's faculty of law and renting a room in the Mittelstrasse. Although studying law, he was fascinated by philosophy, and looked for a way to combine the two, believing that "without philosophy nothing could be accomplished". Marx became interested in the recently deceased German philosopher G. W. F. Hegel, whose ideas were then widely debated among European philosophical circles. During a convalescence in Stralau, he joined the Doctor's Club (Doktorklub), a student group which discussed Hegelian ideas, and through them became involved with a group of radical thinkers known as the Young Hegelians in 1837; they gathered around Ludwig Feuerbach and Bruno Bauer, with Marx developing a particularly close friendship with Adolf Rutenberg. Like Marx, the Young Hegelians were critical of Hegel's metaphysical assumptions, but adopted his dialectical method in order to criticise established society, politics, and religion from a leftist perspective. Marx's father died in May 1838, resulting in a diminished income for the family. Marx had been emotionally close to his father, and treasured his memory after his death. By 1837, Marx was writing both fiction and non-fiction, having completed a short novel, Scorpion and Felix, a drama, Oulanem, and a number of love poems dedicated to Jenny von Westphalen, though none of this early work was published during his lifetime. Marx soon abandoned fiction for other pursuits, including the study of both English and Italian, art history and the translation of Latin classics. He began co-operating with Bruno Bauer on editing Hegel's Philosophy of Religion in 1840. Marx was also engaged in writing his doctoral thesis, The Difference Between the Democritean and Epicurean Philosophy of Nature, which he completed in 1841. It was described as "a daring and original piece of work in which Marx set out to show that theology must yield to the superior wisdom of philosophy": the essay was controversial, particularly among the conservative professors at the University of Berlin. Marx decided, instead, to submit his thesis to the more liberal University of Jena, whose faculty awarded him his PhD in April 1841. As Marx and Bauer were both atheists, in March 1841 they began plans for a journal entitled Archiv des Atheismus (Atheistic Archives), but it never came to fruition. In July, Marx and Bauer took a trip to Bonn from Berlin. There they scandalised their class by getting drunk, laughing in church, and galloping through the streets on donkeys. Marx was considering an academic career, but this path was barred by the government's growing opposition to classical liberalism and the Young Hegelians. Marx moved to Cologne in 1842, where he became a journalist, writing for the radical newspaper Rheinische Zeitung ("Rhineland News"), expressing his early views on socialism and his developing interest in economics. He criticised both right-wing European governments as well as figures in the liberal and socialist movements whom he thought ineffective or counter-productive. The newspaper attracted the attention of the Prussian government censors, who checked every issue for seditious material before printing; Marx lamented that "Our newspaper has to be presented to the police to be sniffed at, and if the police nose smells anything un-Christian or un-Prussian, the newspaper is not allowed to appear." After the Rheinische Zeitung published an article strongly criticising the Russian monarchy, Tsar Nicholas I requested it be banned; Prussia's government complied in 1843. Marx and von Westphalen had seven children together, but partly owing to the poor conditions in which they lived whilst in London, only three survived to adulthood. The children were: Jenny Caroline (m. Longuet; 1844–1883); Jenny Laura (m. Lafargue; 1845–1911); Edgar (1847–1855); Henry Edward Guy ("Guido"; 1849–1850); Jenny Eveline Frances ("Franziska"; 1851–1852); Jenny Julia Eleanor (1855–1898) and one more who died before being named (July 1857). There are allegations that Marx also fathered a son, Freddy, out of wedlock by his housekeeper, Helene Demuth. Marx frequently used pseudonyms, often when renting a house or flat, apparently to make it harder for the authorities to track him down. While in Paris, he used that of "Monsieur Ramboz", whilst in London he signed off his letters as "A. Williams". His friends referred to him as "Moor", owing to his dark complexion and black curly hair, something which they believed made him resemble the historical Moors of North Africa, whilst he encouraged his children to call him "Old Nick" and "Charley". He also bestowed nicknames and pseudonyms on his friends and family as well, referring to Friedrich Engels as "General", his housekeeper Helene as "Lenchen" or "Nym", while one of his daughters, Jennychen, was referred to as "Qui Qui, Emperor of China" and another, Laura, was known as "Kakadou" or "the Hottentot". According to the biographer Sylvia Nasar, Marx never learned to properly speak English and never visited an English factory despite living in England during his last thirty years. 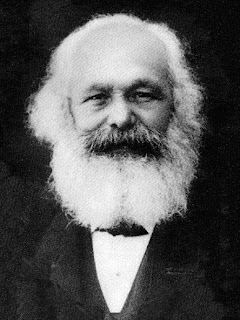 Following the death of his wife, Jenny, in December 1881, Marx developed a catarrh that kept him in ill health for the last 15 months of his life. It eventually brought on the bronchitis and pleurisy that killed him in London on 14 March 1883 (age 64). He died a stateless person; family and friends in London buried his body in Highgate Cemetery, London, on 17 March 1883. There were between nine and eleven mourners at his funeral. On the 14th of March, at a quarter to three in the afternoon, the greatest living thinker ceased to think. He had been left alone for scarcely two minutes, and when we came back we found him in his armchair, peacefully gone to sleep—but forever. Marx's daughters Eleanor and Laura, as well as Charles Longuet and Paul Lafargue, Marx's two French socialist sons-in-law, were also in attendance. Liebknecht, a founder and leader of the German Social-Democratic Party, gave a speech in German, and Longuet, a prominent figure in the French working-class movement, made a short statement in French. Two telegrams from workers' parties in France and Spain were also read out. Together with Engels's speech, this constituted the entire programme of the funeral. Non-relatives attending the funeral included three communist associates of Marx: Friedrich Lessner, imprisoned for three years after the Cologne communist trial of 1852; G. Lochner, whom Engels described as "an old member of the Communist League"; and Carl Schorlemmer, a professor of chemistry in Manchester, a member of the Royal Society, and a communist activist involved in the 1848 Baden revolution. Another attendee of the funeral was Ray Lankester, a British zoologist who would later become a prominent academic. Upon his own death in 1895, Engels left Marx's two surviving daughters a "significant portion" of his $4.8 million estate. Marx's tombstone bears the carved message: "WORKERS OF ALL LANDS UNITE", the final line of The Communist Manifesto, and from the 11th Thesis on Feuerbach (edited by Engels): "The philosophers have only interpreted the world in various ways—the point however is to change it". The Communist Party of Great Britain had the monumental tombstone built in 1954 with a portrait bust by Laurence Bradshaw; Marx's original tomb had only humble adornment. In 1970 there was an unsuccessful attempt to destroy the monument using a homemade bomb. The late Marxist historian Eric Hobsbawm remarked that "One cannot say Marx died a failure" because, although he had not achieved a large following of disciples in Britain, his writings had already begun to make an impact on the leftist movements in Germany and Russia. Within 25 years of his death, the continental European socialist parties that acknowledged Marx's influence on their politics were each gaining between 15 and 47 per cent in those countries with representative democratic elections.